The Family Engagement Collaborative convenes and activates its members and partners, advocating for funding, resources, and policy solutions that help cultivate awareness for family engagement in the Miami Valley. 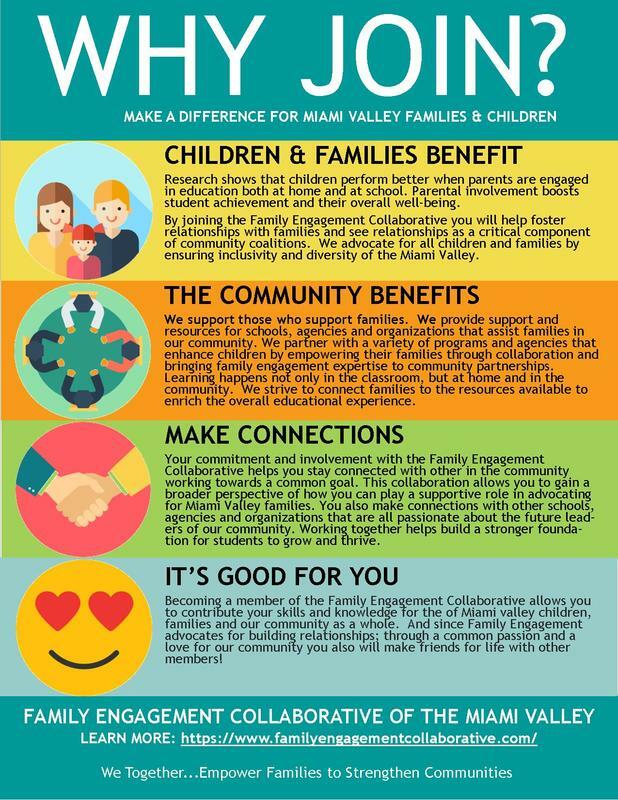 The Family Engagement Collaborative depends on the annual support from our community to help family support agencies and other diverse organizations and professions in the Miami Valley. Our membership program has been designed to raise the much needed funding to support those who support families by providing valuable resources and training. The most essential benefit of becoming a member of The Family Engagement Collaborative is your inner compassion, public endorsement, and dedicated support that comes from helping and advocating for the good of local families and children. You know you are making a difference in many lives by creating strong families and giving Miami Valley children a hopeful and successful future. 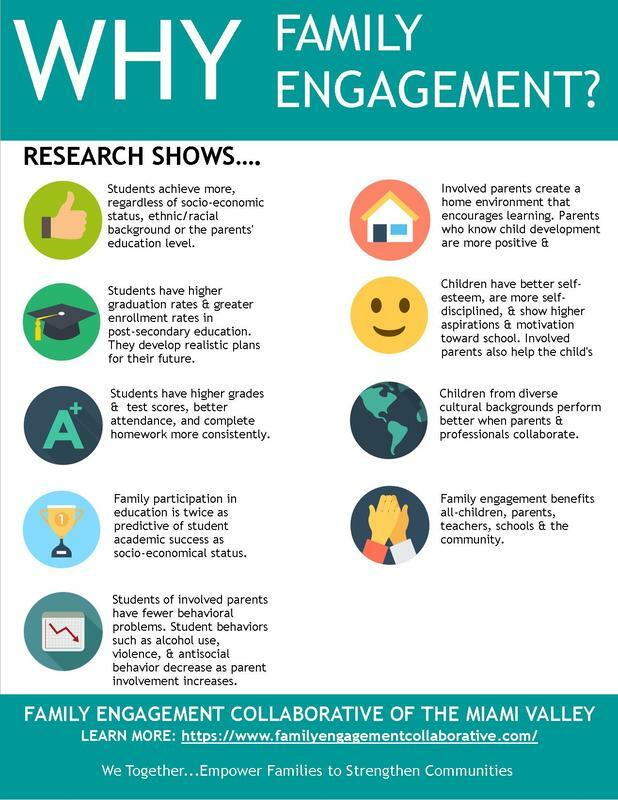 Family engagement benefits all children, parents, teachers, schools and our community. Your commitment helps us to strengthen and grow the family engagement awareness movement in the Miami Valley region. Members are the ones that drive the important work we do as a collaborative for our community. Your generous backing helps us to fund and maintain our active website that is full of resources for both agencies and families, including toolkits, community resources, a community calendar and much more. Your assistance drives our active social media and email marketing campaigns. With your continued patronage we are capable in providing extensive training, workshops and tools that include but not limited to the family engagement System Self-evaluation (FESSE) and Family Café education and guidance. The funding our memberships generate allows us to continue to build and foster relationships within our community. We are able to host council and board meetings each month. Our diverse group of community leaders and educators come together to plan and execute family engagement initiatives for the Miami Valley. The collaborative provides networking opportunities, leverages resources, hosts events and focus groups, encourages professional development, conducts research and advocates for a family focused community. Raising the next generation is a shared responsibility. When families, communities and schools work together, students are more successful and the entire community benefits. Family engagement is NOT an event or a program. It is ongoing and requires establishing and maintaining relationships with families and accomplishing change together. Your financial support helps drive our critical work to help children and families in our community. We have a variety of annual membership options to choose from that represent your pledge and responsibility to the safety, care, well-being and future successes of Miami Valley families. It stands to reason that an organization as diverse as The Family Engagement Collaborative would not force its membership into a “one size fits all” mold. There are, in fact, three broad divisions of memberships. Ability to access FEC publications/research, toolkits, and other critical communications and updates through the "MEMBER ONLY" section of our website upon signup. *Printed materials will be updated on an “as available” basis depending on the join date. However, electronic versions of these same documents will be updated within 5 business days and available for download, distribution or can be produced by your own printer. Annual print date of all materials is set for March 1. The Family Engagement Collaborative relies on the support of both individuals and organizations to advance its critical work to support local families and children in the Miami Valley. Your generous support our mission to empower families to strengthen communities.